Teck Metals Ltd. has been hit with what is being described as the largest environmental penalty in British Columbia's history for discharging heavy metals and other pollutants into the Columbia River at Trail. The mining company has been fined a total of $3.4-million for "multiple events" at the Teck smelter in southeast B.C., Marko Goluza, Pacific and Yukon regional director for Environment Canada, said Monday. He said Teck Metals was fined $3-million for three offences under the federal Fisheries Act and $400,000 for two offences under provincial legislation. Mr. Goluza said he couldn't recall a company ever having to pay an environmental fine in B.C. of more than $1-million, making the total fines the largest ever awarded in one environmental case. "The charges relate to 13 accidental discharges that occurred between November, 2013 and February, 2015," the company said in a statement, adding that water with elevated levels of copper, zinc, ammonia, chlorine and cadmium were discharged. Teck Metals said reviews conducted after each incident showed there was "no human health risk and no indication of long-term impact on fish." "Incidents of this kind are simply not acceptable. That is why we are working hard to improve our environmental safeguards," Thompson Hickey, general manager of Teck's Trail operations, said in the statement. "Following each incident, we conducted a thorough review and implemented specific corrective actions," Mr. Hickey said. "We are also investing in additional measures that further enhance our operations and improve overall environmental performance." The Globe and Mail reported last month that Teck Metals was facing fines that could range from $25,000 to $6-million following an investigation by Environment Canada. The fines underscore Teck's ongoing problems in Trail. In 2011, the company was fined $325,000 for leaching mercury into Stoney Creek in Trail, and in 2013, it had to pay $210,000 for discharging sodium hydroxide into the Columbia River. "It's important to note that this [$3.4-million] penalty relates to a number of incidents over two years, making a comparison to previous penalties misleading," Chris Stannell, a Teck Metals spokesman, said in an e-mail when asked to comment on the size of the latest fine. Teck operates the largest lead-zinc smelter in the world in the small town of Trail, which is on the banks of the Columbia River about 16 kilometres north of the B.C.-Idaho border. In 2012, a U.S. federal court found Teck was responsible for cleaning up heavy metals from the Trail operation that flowed down the Columbia, into Lake Roosevelt. The cost of that project, which is still under study, hasn't been determined. Copper and gold smelting first began in Trail in 1896, and in addition to dealing with current pollution problems, Teck Metals is also responsible for remediation of historically contaminated landfills and slag deposits. The seriousness of the pollution in Trail was highlighted in 1975, when tests showed elevated levels of lead in the blood of local children. Since then, Teck has spent $1.5-billion on programs to improve its environmental performance. The company is currently building a $36-million groundwater treatment plant, which is scheduled to begin operating this year. In 2014, Teck spent $125-million on a new acid plant that reduces sulphur dioxide emissions by 15 per cent. 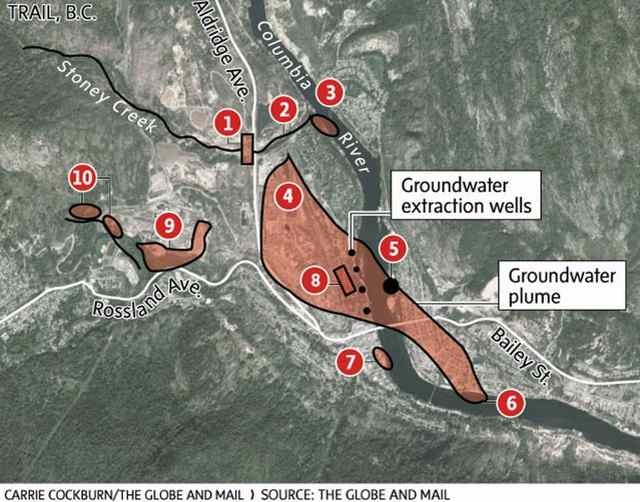 Despite such measures, however, Teck is still striving to deal with an ammonium sulphate groundwater plume that has spread underneath the Columbia River. In a remediation plan filed in 2012, the company noted that "the plume appears to be upwelling into the river." It is not yet known if Teck's water-treatment plant and other measures will succeed in stopping the tainted groundwater from spreading.